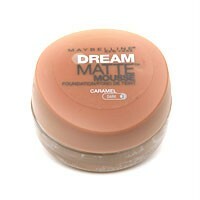 For Best Results, To perfect your skin tone, start by applying foundation down the center of your face first. Use just a small amount of makeup and blend it in thoroughly. Layer more if necessary to achieve the coverage you want. Revolutionary whipped formula provides an air-soft, perfect matte finish coverage, with a weightless feel. Color pigments offer superior coverage. Blends effortlessly for a soft, natural-looking, even-toned result. Lightweight cream foundation is formulated with jojoba oil keep skin moisturized and comfortable.